The Artwood series was crafted to produce a traditional as well as a modern guitar. Technology moves forward at a frantic pace and the world of guitar craftsmanship is no different. 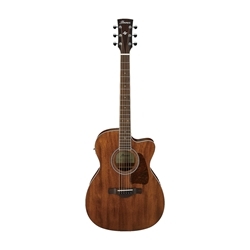 In producing the Artwood series, Ibanez has respected the rich tradition of the acoustic guitar while adding modern interpretations in their continuing search for the ultimate in guitar tone.For warm, balanced tones and superb player comfort in an affordable instrument, look no further than the Ibanez AC340CE. The cutaway Grand Concert body is made using a solid mahogany top, mahogany back sides, and even a mahogany neck. It comes with a Fishman Sonicore pickup and an Ibanez preamp for great plugged-in sound, and comes complete with an ovangkol bridge and fretboard, chrome die-cast tuners, a bone nut, and more! Case not included.Get your Ibanez AC340CE Artwood Acoustic-Electric Guitar today at the guaranteed lowest price from Sam Ash Direct with our 45-day return and 60-day price protection policy.